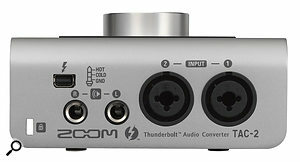 Zoom’s TAC-2 is the cheapest Thunderbolt interface currently available, but is premium quality really possible on a budget? 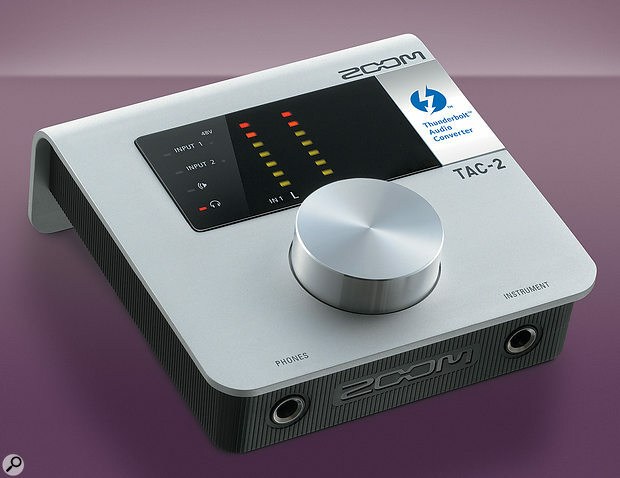 Hailing from a company best known for their low-priced effects boxes, field recorders and Portastudios, the TAC-2 is Zoom’s very first dedicated audio interface. Packaged in a desktop, monitor controller-style case, this device is designed for high-quality playback and occasional recording duties. It’s approximately half the price of its closest Thunderbolt-ready competitor, and so is aimed at users who want to make use of the high bandwidth and low-latency capabilities of this relatively new technology without breaking the bank. The Zoom features two simultaneous inputs and outputs — including one instrument-level input — and recording qualities up to 24-bit/192kHz. The TAC-2 enjoys a brushed aluminium-effect top panel made of plastic. In my experience, this type of case does tend to be relatively hardy, but the lack of real metal means that it doesn’t really feel ‘premium’ and I’d be concerned about whether the finish would wear away over time. Nevertheless, the interface is well weighted, with rubber feet on the under side to keep it stable on the desktop. A large, single rotary control offers a simple approach to operation, with the various functions cycled through by clicking the dial, following up with a twist to adjust levels. Again I found the hardware to be not quite as hardy as it might be — the big knob feels a little flimsy under hand. Usefully though, the dial is ‘notched’ in 3dB steps to assist with accurate setting of gain and output levels. Similarly, individual phantom power switching is a welcome inclusion. Turning the phantom power on and off requires a long press and hold, and since the outputs are not muted when this happens, it does result in a pop and a few seconds’ blast of noise. Input gain may be set for both inputs simultaneously as well as independently (eg. to match levels for a stereo pair), whilst seven-segment LED meters situated above the dial show the strength of either input or output signals in a satisfying degree of detail. Two combination connectors are available for mic/line inputs, with the first of these being disabled when the instrument input is in use. Main outputs are on balanced TRS jacks and a single Thunderbolt port connects the interface to the computer and provides bus power.Connections for inputs and outputs on the device are minimal, but this makes for a relatively uncluttered experience when cables are plugged in. On the back panel two combi connectors are provided for mic/line inputs, whilst the two outputs are on balanced TRS jacks. Thunderbolt connects the interface to the Mac and provides bus power, so there is no annoying wall-wart to contend with — a definite plus for location recording! Around the front there is an instrument-level input for bass or guitar (which takes precedence over mic/line input 1 when used), plus a single headphone output. Preparing the interface for action is extremely simple. There’s no disc in the box, so you simply go online to download the driver and control software and then install them. In addition to controlling the hardware, the included MixEfx software takes care of updates, with a default preference alerting the user when updates to the software or firmware are available. MixEfx is a handy, yet somewhat frustrating, application used to set up the direct monitoring mix, including the addition of on-board effects to the headphones. There is no provision for controlling direct monitoring using hardware controls, a definite limitation which, in my mind, serves to detract from the ‘one-dial-does-all’ operation. Many other interfaces of this size at least provide a means of turning direct monitoring on via the hardware and setting the level of each input being sent to the headphones. Enhanced preamp features are also available in the MixEfx panel in the form of a high-pass filter (fixed at 80Hz) and polarity switch for each input. An auto gain facility makes level setting an easy task, but again this is only available via the software. My final and more fundamental gripe to report is that the foldback mix is always routed to the main outputs as well as the headphone socket. Whilst this might be handy for using the interface as a live digital mixer of sorts, it’s definitely not so handy when you are tracking instruments and switching between headphones and studio monitors. You have to resort to constant muting and un-muting of the monitor mix and main mix to avoid feedback. A routing toggle switch would have been a far more elegant and flexible solution, and in this respect, such an implementation leaves me flummoxed. Despite the various annoyances described above, MixEfx is simple to operate, with controls laid out ergonomically. The MixEfx control panel offers additional preamp features such as high-pass filter, polarity reversal and an auto gain feature. The Mixer panel at the bottom left of the window is used to establish a headphone mix, whilst the Effect section at the top right is used to add reverb or delay to the input signals. In session, the preamps sound nicely transparent to my ears, offering lots of level even on the very lowest gain settings when a condenser mic is plugged in. Auto gain works well too (although you have to manually turn it off once the correct level is established) and offers users three choices of maximum level for the recording, namely 0, -6 and -12 dB. Setting up the headphone mix is straightforward. There is a level and pan control for each input, plus an aux send in the effects section to establish how much reverb or delay is added to the input signal. The on-board DSP processing is extremely basic on this unit; there’s no control over reverb time aside from a couple of room presets, and the delays have fixed time and feedback parameters. Whilst useful enough for simple ‘comfort’ effects whilst tracking, they don’t really align well with the intended professional quality of the device. You really shouldn’t expect a glorious Lexicon-quality reverb here — the reverbs are typically dark and metallic in character. Whilst recording, I found the aforementioned permanent routing of the headphone mix to the main stereo outputs to be annoying, since my usual workflow sees me tracking instruments with the headphones on, and then playing takes back on speakers. With hope, the developers over at Zoom will address this for the next revision of MixEfx. Despite some frustrations, the TAC-2 is capable of producing some very respectable recordings at high sample rates. It’s perhaps the unit’s digital-to-analogue converters that are the most impressive part of the overall package in my opinion, undoubtedly proving alluring to those needing to undertake critical listening for mixing and/or mastering. In comparison to the on-board sound on my Mac, I found the playback of uncompressed audio to be incredibly detailed in the high and high-mid frequency ranges, with clear separation between instruments in the stereo image plus sharp transients on snares and toms. Bass instruments were also very well defined and sounded thicker overall than on the Apple hardware. The TAC-2 really brought my reference tracks alive, frequently causing spontaneous fits of air drumming and really changing my overall impressions of the interface. 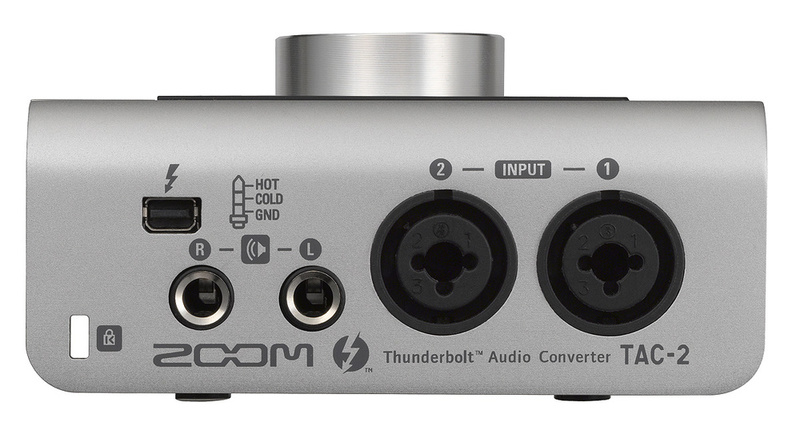 All in all, the Zoom TAC-2 is an extremely capable Thunderbolt interface at a budget price. There are some minor niggles with operation and build quality that may put off some potential purchasers, but this doesn’t necessarily warrant stumping up the extra cash needed for one of its premium-brand rivals or detract hugely from the impressive audio quality. Those needing more plentiful inputs and outputs might like to look at alternative USB 2 interfaces, or else wait to see whether Zoom announces a bigger brother to the TAC-2. At the time of going to press, the cheapest alternative Thunderbolt interface was almost twice the price, so USB 2 and Firewire interfaces seem the best options to consider. The Focusrite Forte is a USB 2 device that offers both Mac and PC compatibility. It has four outputs compared to the Zoom’s two, a genuine aluminium case and simultaneous input and output metering. Reviewed SOS November 2012. The Apogee Duet 2 (SOS March 2012) is a Firewire device for Mac OS that, according to Apogee, works flawlessly with the Apple Thunderbolt to Firewire adapter. Although slightly more expensive than the Zoom, the Duet 2 offers high-quality converters and preamps that really impress. A wide range of monitor controller features are present, and the headphone socket doubles as additional line outputs. The Duet 2 is also iOS compatible. Mac OS 10.8.5 upwards, requires Thunderbolt port (tested using OS 10.9.4). Recording resolution up to 24-bit/192kHz. TAC-2 MixEfx software for advanced control of features (via download). Two mic/line XLR/jack combination inputs. One instrument jack input (disables input 1 when in use). Two TRS balanced line outputs. Supplied with Thunderbolt cable and operation manual. Quality preamps and impressive D-A converters. Hardware is simple to operate. Around half the price of competitors. Bus powering makes it ideal for mobile applications. DSP effects are incredibly basic. Foldback mix is permanently routed to the main outputs. Some key functions (eg. direct monitoring controls) are only available via software. An easy-to-use device with great sound quality. A commendable budget option if you need to use Thunderbolt, but similarly priced USB 2 and Firewire interfaces may well still have the edge in terms of build quality and input/output specifications.